We truly believe that your closest ally when you cook is your knife. If you learn how to take care of it and use it with confidence and fluency, the kitchen will soon become your happy domain, a place where your creativity can jump leaps and bounds. 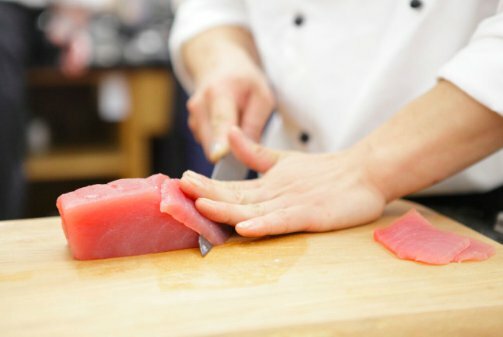 Having trouble finding your way to slicing and dicing like a pro? We’re here to help. Ask any chef what they feel is the most important building block in their repertoire of skills and they will inevitably single out knife skills. Tonight, we’ll isolate basic techniques and work out specific ingredients for you to practice on so that we can zoom in on the areas where you need extra support. You will have plenty of opportunity to liaise with our tutors about your own special needs as we also advise you on how to buy, store, and sharpen your own special set. All activities build towards a light dinner, so no need to pack a snack – we'll keep you fuelled so that you stay sharp tonight!